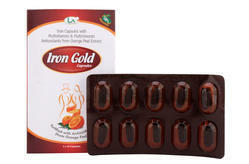 Our range of products include iron gold capsules and iron gold syrup. Iron is very important for the production of hemoglobin in your blood and for supplying oxygen to red blood cells. It is also essential for a healthy immune system and for energy production. Iron supplements are particularly very important for menstruating & pregnant women, adolescents and growing children, & those on vegetarian diet. Iron Gold Tonic will increase Blood hemoglobin & given red / glowing skin. Iron should be taken with Vitamin C. The presence of vitamin C can increase iron's absorption by as much as 30 percent. Orange peel extract In Iron Gold Tonic is rich in Vitamin C complex. Avoid taking an antacid at the same time you take iron. Stomach acid is needed to properly absorb iron. Absorption of Iron is better when taken with Vitamin B-complex, Copper, Manganese and Molybdenum. They are needed for complete iron absorption. Iron Gold Tonic has all these ingredients. Iron absorption is a complex issue. 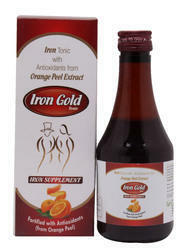 Vitamin C is very important for Iron absorption and hence Iron Gold Tonic has added benefits of Orange Peel Extract. Orange Peel is the ripened rind of the Orange fruit (Citrus sinensis) and is a particularly rich source of vitamin C and Bioflavanoids (particularly hesperidin).These have antioxidant properties and help body to utilize Vitamin C to the maximum.Pectin in orange peel extract helps present stomach irritation caused by other iron tonics. Quality constitution based iron gold capsules come with rich support of multivitamins & antioxidants and support production of hemoglobin in blood. Providing for rich supply of oxygen to red blood cells, it supports requirements of healthy immune system. Further, these iron supplements are important for growing children, menstruating & pregnant women and others where these help in enhancing blood hemoglobin levels in body. Coming with superior antioxidant properties, its superior constitution also provides for highly effective results.